Now that the Lunar New Year is coming up, it’s time to learn more about the Year of the Pig, and what significance that Chinese New Year has in its original homeland. It wasn’t that long ago that we bade farewell to 2018 and we all greeted 2019 with an uproar. Now that the Lunar New Year is coming up, it’s time to learn more about the Year of the Pig, and what significance that Chinese New Year has in its original homeland. Lunar New Year is marked in many parts of Asia, in China, 2019 is also known as the Year of the Pig. Until February 4th, however, we are still under the spell of 2018 and the Year of the Dog. The 4th is also considered Chinese New Year’s Eve. The Year of the Pig starts on the 5th, but the New Year doesn’t always fall on a February date. Sometimes, it can be in late January as well; this is true of 2020 when January 25th heralds the latest Year of the Rat. As raucous as the new year’s celebrations are for New Year’s Eve and New Year’s Day on December 31st and January 1st, Chinese New Year is just as big of a deal, if not more. Here are some of the culturally significant ways to celebrate this holiday. Putting Up Decorations: The Chinese New Year is also known as the Spring Festival. During this time, many decorations are put up – and they’re usually red. That’s because red is considered a lucky color in Chinese culture. Since it’s the Year of the Pig, many of the decorations will include images of pigs. Spending Time with Family: Spending time with family during the holidays is something that’s often done during the holidays we observe here in America. Given how family-oriented Chinese culture is, this shouldn’t be a surprise, either. This time of year is thought of reunion time, complete with a banquet dinner. Setting Off Fireworks: If you think the fireworks displays during Fourth of July and New Year are impressive, just wait until you see some of the spectacular fireworks that accompany Lunar New Year celebrations. Exchanging Gifts: Gift-giving is another tradition practiced at Chinese New Year. 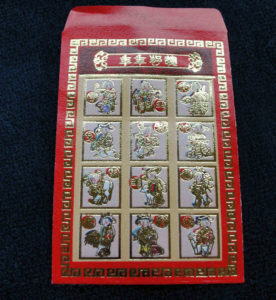 Red envelopes full of money are some of the most popular gifts, mainly because they’re supposed to bring good luck for the coming year ahead. This entry was posted on Friday, February 1st, 2019 at 11:25 am . You can follow any responses to this entry through the RSS 2.0 feed. Both comments and pings are currently closed.